Buffalo Bob Smith died in Hendersonville, North Carolina on July 29, 1998. He was 80 years old. Although certainly he will be missed, he can never be truly gone. He lives within the hearts of all who came to know his smiling face and affable manner. This is a personal recollection. A difficult one. My Father, Calvin Rich, died in February. And, he and Buffalo Bob were friends. But you came here to remember Buffalo Bob, so let me tell you about the man. Maybe give you a fuller image of him and share some things you may not know. He was married to the same woman, Mildred (Millie) for 57 years. A sweetheart of a gal who gave him three sons, Robin, Ronald and Christopher. Buffalo and Millie loved football. Before Joe Robbie Stadium, when teams played in the Orange Bowl, folks who were wise parked in a Federal housing project across the street. Many a trunk party was held on these grounds. A lovely area full of trees and shady areas. My Dad used to tell me what it was like to enjoy pre-game festivities with Buffalo. Dad called him the Pied Piper because throngs of people followed him everywhere. I thought Dad had exaggerated until I saw it for myself one Sunday. Today we have gotten used to the idea of celebrity as deity. Not so with Buffalo Bob. He was generous and giving with his fans, and you don’t see much of that anymore. What a gift and joy to be a person held with such affection by so many. I watched the faces as folks came up and said “Howdy” to Buffalo Bob. People became light in step and demeanor. Just for a moment, all the years faded away. He hadn’t changed much in appearance. Oh, the hair was gray, but the smile was the same. And, the voice was unmistakable. Hey, kids, what time is it? (Wav – 39K)We grew up hearing those words. Thirteen seasons worth of wishing we could be the lucky ones sitting in the Peanut Gallery. Buffalo Bob was a great musician. Dad used to talk about how he’d entertain guests in his Fort Lauderdale home by playing this fancy electronic keyboard. Dad also mentioned the photos on the walls. Not your average stuff. Pics of Buffalo with all these American Presidents. Signed, no less! Plus celebrity photos galore. He was heavily in demand. Everyone wanted Buffalo Bob to make an appearance. And, collectors were keen for his signature! 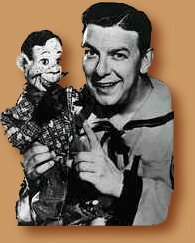 All those highly prized Howdy Doody collectibles are a direct result of Bob Smith’s business acumen. He saw television’s huge marketing potential right from the beginning. In 1991 the Smiths moved to Flat Rock, North Carolina. My Father still saw him on occasion as he summered nearby in Highlands, N.C. Why the move to North Carolina? Golf, dear friends. To call these men avid golfers, is to call Howdy Doody just a puppet. They were passionate devotees of the game. I like to think that now that Buffalo Bob is putting on Heaven’s greens, maybe he and my Dad can wander over to the 19th Hole and see down here. Buffalo Bob Smith, we hate that you are gone because you carried in you a part of our innocence. Some of what is best about us – we learned from you. We will never allow you to be forgotten. To do so would be to deny a piece of our hearts.